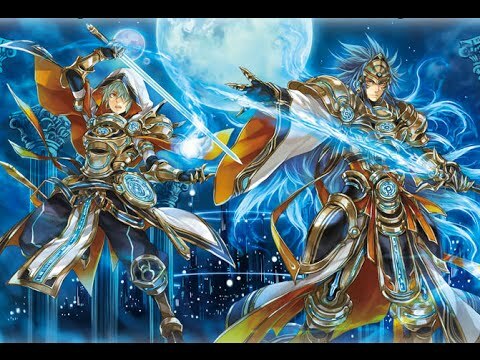 [Article] Cardfight Retrospective: Gold Paladin Pt.3; Some like it…Blue Hot? Welcome people to the third part of the Gold Paladin retrospective. This time we will be looking at the era of Legion, possibly the shortest format in the history of the game. As in, there were only two main sets for this game. Take a shot every time someone said “Mate”…and try not to die. As a brief recap, these Bluish Flame Liberators were used by the antagonist, Olivier Gaillard. He showcased the potential of these new Liberators by making Kai look like a jobber. He even utilized some of Aichi’s old Liberators which real life players also do. To start off this part we will look at the new Trial Deck at the time; Divine Judgement of the Bluish Flames with the unit that makes women wet themselves both figuratively and literally, Oath Liberator Aglovale. [AUTO]:[Counter Blast (1)] When this unit is placed on (RC), if you have a vanguard with “Liberator” in its card name, you may pay the cost. If you do, look at three cards from the top of your deck, search for up to one card with “Liberator” in its card name from among them, call it to an open (RC), and put the rest on the bottom of your deck in any order. And now you can see why. This is a very powerful card since it not only fills up your field much like a typical Gold Paladin unit, but also because he lets you pick from the top 3 cards which basically ensures either a quality booster or another attacker. Aglovale became an immediate 4-of stable because of that strong of an early game was nearly unprecedented, at least to my knowledge. It can even be said that Aglovale was the originator of high quality rush down decks such as the modern day 7Crush or the Sanctuary Blaster deck. Hell even back then it was better to hold back and stay at Grade 2 so your opponent won’t perform Legion. I digress however. The point is that unless you were poor, there was no reason not to run 4 of him. If there is one downside it is the fact that Aglovale’s effect can only trigger when he shows up in the Rear Guard circle which can be problematic at times since there will be games where you’re forced to ride him. That is the only weakness I can think of though. The next card is Aglovale’s mate Bluish Flame Liberator, Percival. [AUTO](VC):When this unit Legion, look at four cards from the top of your deck, search for up to one card with “Liberator” in its card name from among them, call it to an open (RC), and put the rest on the bottom of your deck in any order. Pretty straight forward but for a Trial Deck card this was pretty good. It basically fills up your field in case the opponent was actively retiring your Rear Guards, and can hit for good numbers. Percival is really vanilla, but it does showcase the potential of What Bluish Flame Liberators were capable of. Also Gailard called him his Avatar which is kinda stupid considering how vanilla it is, but Aichi has Blaster Blade who more often than not was also vanilla, so who I am to judge? Now normally I would talk about the new cards of the set in that time period, but I think it’s important to revisit one of the older Liberators, May Rain Liberator, Bruno. Didn’t expect that did ya? [AUTO](RC):When your other «Gold Paladin» is placed on (RC) from your deck, if you have a vanguard with “Liberator” in its card name, this unit gets [Power]+3000 until end of turn. Why is it important I show you this again? Well keep in mind that Bruno gains an additional 3000 power each time you called a Rear Guard from the deck. The funny thing about that is Bruno can easily go for monstrous numbers, from as little as becoming a 10000 booster, which if you and your opponent were Grade 2 and called Aglovale in front of him you would be forcing at least two cards from the opponent’s hand, to something along the lines of 20000+. Bruno was actually one of the deck’s win conditions since people don’t often have enough defense to keep a Rear Guard boosted by Bruno’s huge numbers away. However as a result Bruno’s price was like $8 during the hype of Bluish Flames since it WAS hard to get. Thankfully Bushiroad learned that people actually like them when they do reprints, which is why we got a Revival Collection earlier this year. The next card is Ketchgal Liberator. [AUTO]:[Put this unit on the bottom of your deck] When this unit is placed on (RC) from your deck, you may pay the cost. If you do, look at three cards from the top of your deck, search for up to one card other than a card named “Ketchgal Liberator” from among them, call it to an open (RC), and shuffle your deck. Liberator players will you PLEASE end your turn already? Remember earlier how I said Bruno can hit monstrous numbers? Well that is due to the interaction of Ketchgal, since Ketchgal first shows up on the field from a Superior Call and then Bruno gains another 3000 power. After that you resolve Ketchgal’s ability and summon another unit which gives Bruno another 3000. This WOULD be the end since you cannot call Ketchgal Liberator if Bushiroad didn’t made Zorron as well. Ketchgal is also interesting since it didn’t had any restrictions of what to call nor what the Vanguard is, so it can be splashed in other Gold Paladin decks. It was also arguably the first card that made people debated if they should run it despite being a Stand. Overall most Bluish Flame Liberators run 4 of this pupper. Now I will have to talk about the other Liberator Legion, and you tend to run these if you really want to play Liberators but was too poor to make a good them. 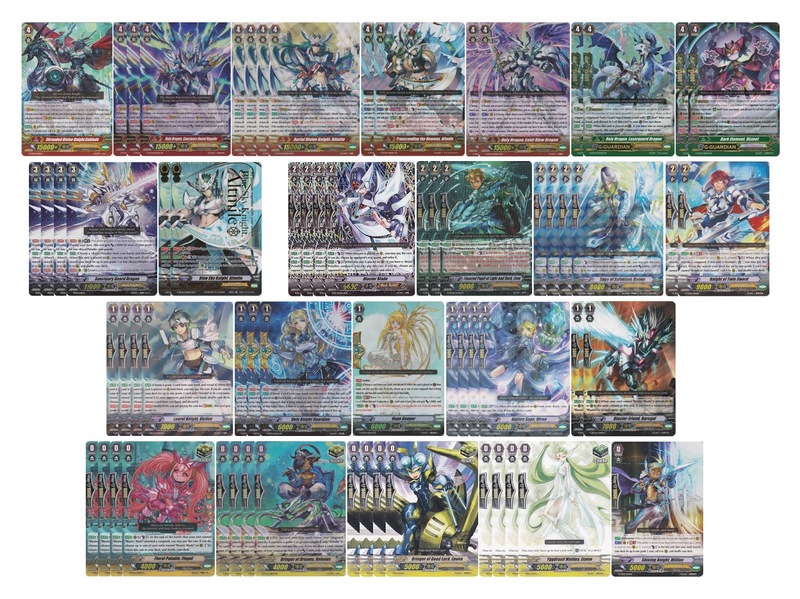 [AUTO]:When this unit is placed on (RC) from your deck, if your vanguard is Legion, choose up to two of your other units, and they get [Power]+3000 until end of turn. [ACT](VC):[Counter Blast (2) & Choose one card with the same card name as a unit in your (VC) from your hand, and discard it] If this unit is Legion, look at four cards from the top of your deck, search for up to two cards from among them, call them to separate open (RC), put the rest on the bottom of your deck in any order, and those units get [Power]+5000 until end of turn. Trahern is an interesting choice since in theory he CAN power up your Rear Guard, which includes Bruno, and thus it is safer to run Ketchgal since one of your Grade 2 Rear Guards will have 12,000 power, and standing that with Ketchgal will force a 10000 shield value. Coil also fills up your board as well and powers those Rear Guards up. On a good day you would have a column hitting 26,000 which was decent for the time period. However its 2 CB cost and discard a specific unit, while not that bad due to its deck thinning, makes it a tad undesirable for the somewhat soft advantage it offered. Here’s a funny thing though; in Japan Coil was a RRR, but in English he was knocked down to R. That was fine for a lot of people since it meant people can get RRRs that they truly desire. Now for the deck’s main starter, Flaming Passion Liberator Guido. It’s not easy being fabulous. [ACT](RC):[Put this unit into your soul] If your vanguard is Legion, look at three cards from the top of your deck, search for up to one card with “Liberator” in its card name from among them, call it to an open (RC), and shuffle your deck. Again this is a really solid card. Actually since it feeds into the Soul which in turn can help you pay for Soul Blast costs, people would sometimes run this guy at 2. Guido is basically a costless Superior Caller who can turn into a better booster or a front liner. I mean this kind of power on a Forerunner was very impressive at the time. However nowadays unless Forerunners do something ridiculous cards like Guido will be considered to be average. However how can you turn down a man of passion like Guido? Another stable for Bluish Flame Liberators is Liberator, Lawful Trumpeter. [AUTO](RC):When your vanguard Legion, look at three cards from the top of your deck, search for up to one card with “Liberator” in its card name from among them, call it to an open (RC), and put the rest on the bottom of your deck in any order. During it’s time this was a fantastic card. It basically gives +1 simply by performing Legion, which is what you want to do with Bluish Flames. This card helps with getting a field presence, recovery from having your field wiped, enables more calls, and can even act as an attack bait cause the opponent would naturally want to go after Lawful. However, keep in mind that I said “During it’s time”. The requirement for you to get it’s effect is to perform Legion, but if you do that then you’re not performing Stride. This is problematic since unless your Legion is really good, not Striding will hurt you a lot. Lawful was once good, but as the meta changes, so too did his usefulness waned. What? You mean you don’t evolve into a dragon? [AUTO](VC):When your unit with the same card name as a unit in your (VC) is placed on (RC) from your deck, if this unit is Legion, this unit gets [Power]+3000/[Critical]+1 until end of turn. [ACT](VC):[Counter Blast (1) & Choose one of your rear-guards, and retire it] Look at four cards from the top of your deck, search for up to one card with “Liberator” in its card name from among them, call it to (RC), and put the rest on the bottom of your deck in any order. This ability cannot be used for the rest of that turn. No question about it, this is pretty good. It synergizes with the established pressure game that Bluish Flames have, in the event you get a bad call or even just want to buff Bruno up, he can CB1 and sack one of your own units. Sacking a unit wasn’t even a bad thing since it would fuel the requirements to perform Legion. This was a very powerful card indeed, but it was outshined by the true Legion boss during it’s time. However Prominence Core was something not to be trifled with. Now Aglovale thought that he wasn’t good enough as he was, so he decided to take some vitamins, work out a little, and get some tattoos. This results in Regulation Liberator, Aglovale. Ugh…last time I take a dare from Phallon. [AUTO](RC):When this unit attacks, if you have a vanguard with “Bluish Flame” in its card name, this unit gets [Power]+2000 until end of that battle. [AUTO]:[Soul Blast (1)] When this unit is placed on (RC) from your deck, you may pay the cost. If you do, look at five cards from the top of your deck, search for up to one card with “Bluish Flame” in its card name from among them, reveal it to your opponent, put it into your hand, and shuffle your deck. Yeah this basically replaces Phallon as our solo Grade 2 attacker even though it requires a more specific sub-archetype. The important thing to note is his second ability, which adds any Bluish Flame units from the top 5 cards in the deck. Said Bluish Flame units are all Grade 3s so you can actually secure your ride or get Stride fodder for the next turn. While not as universally as helpful compared to Oath Aglovale, Regulations is still a pretty important card for the deck not only for the searching, but because he is the Mate for the ultimate boss of the Bluish Flames. Now this is a part where I insert a drum roll but seeing as sound files are out of league, make one up yourself. Now for the boss of the Liberators, here is Bluish Flame Liberator, Prominence Glare. [AUTO](VC):[Counter Blast (1) & Choose a card with “Bluish Flame” in its card name from your hand, and discard it] When your unit is placed on (RC) from your deck, if this unit is Legion, you may pay the cost. If you do, until end of turn, this unit gets [Critical]+1 and “[CONT](VC):During the battle that this unit attacks, your opponent cannot call grade 1 or greater units from hand to (GC).”. [ACT](VC):[Counter Blast (1) & Choose one of your rear-guards, and retire it] Look at four cards from the top of your deck, search for up to one card with “Liberator” in its card name from among them, call it to (RC), and put the rest on the bottom of your deck in any order. This ability cannot be used for the rest of that turn. By Odin’s Beer this is some ridiculousness. Basically if you got intimidated by the wall of text (I don’t blame you), basically this was a Guard locker meaning your opponent wouldn’t be able to Perfect Guard it. Combined that with a Bruno who gotten bigger as the chain calls got longer and longer, and rarely do people have enough cards to guard with. Keep in mind that this was Gold Paladin, a clan that normally doesn’t have finishers due to being a very advantageous deck. I like to know what Bushi was drinking cause Glare is very awesome! Well…at least for it’s time period. You see Guard Lockers like Prominence Glare lost a lot of their competitive edge with the introduction of Generation Guards. This gives players more defensive options which was needed very badly, but as a result, it harmed the Guard lockers and even to a few restanders like Thing Saver Dragon. Even a Bruno boosting for 22000 wasn’t enough anymore, since now the opponent can drop a 20k G-Guard and another 10k shield to make it a 2-to-break. Glare was a very powerful card, but this is a case where power creep really hurt the guy. Season 4 comes to a close and this was widely considered to be Gold Paladins at their highest peak. They can perform huge rushing, maintain advantage, and even had a powerful finisher. They were great for their time period, but sadly their glory days are pretty much done for. However they had left quite a legacy and it would be tough to fill those huge shoes in. Next time we will go what I like to call the “Lost Ages for Clans” as we look at the new group of Gold Paladins to lead on. The guy who is fascinated with the Paladins even though he prefers mages.